Description:Heart-shaped aquarium is the best gift for your lover. Close your eyes, just imagine that your sweet likes a fish live in your heart. 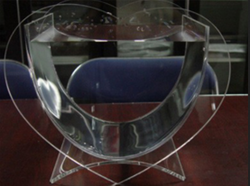 These Fish Bowls are made using high grade glass and strong plastic. Our Aquariums are available in variegated shape. Suitable to keep labyrinth fish in small numbers. Available in size of 8", 10", 12" diameter. Made of clear glass.